... Over an extended period of time, an invasive species planted in a home garden has the ability to spread to other natural areas, degrade land, and disrupt natural habitat. Unlike native plants, invasive weeds have no natural predators in non-native natural environments, which allows their population to grow unchecked. One invasive species is the Japanese Barberry (some varieties), which is commonly planted in gardens for its pale yellow flowers and bright red berries but which pose a severe ecological threat in natural habitats by altering soil pH, nitrogen levels, and biological activity in the soil, thus reducing wildlife habitat. Another invasive weed is the Purple Loosetrife, commonly planted for it’s beautiful purple flowers but which outcompetes and replaces native grasses and flowering plants in wetlands areas, thus forming a dense, homogenous clump and reducing habitat for waterfowl. Invasive weeds have plagued New York City’s natural environment for centuries, arriving with the first migration of Europeans to the continent and currently transported through trade and commerce. Invasive weeds that thrive in the New York City are able do so because the City’s climate is similar to that of their country of origin. Many common invasive weeds in New York City hail from Korea, Japan, and parts of China, where average temperature, amount of rainfall, and rainfall distribution is similar to that of New York City. Gardeners should check out the Parks Department's Do Not Plant list of species invasive in the New York City area. The NYC Department of Health and Mental Hygiene announced today that a raccoon has tested positive for rabies in Manhattan. Rabies is prevalent in Staten Island. it seems just a matter of time before it's detected in Brooklyn. A raccoon dropped off by two New Yorkers at the Manhattan Animal Care and Control Shelter tested positive for rabies yesterday, the New York City Department of Health and Mental Hygiene reported today. The Health Department is trying to identify these individuals, who may have been exposed to rabies while handling the animal. Rabies is a fatal disease, but it can be prevented if exposed individuals get rabies shots. There has not been a case of human rabies in New York City for more than 50 years. The individuals brought the injured raccoon, wrapped in a blanket and placed in a pet carrier, to the East 110th Street shelter on the evening of Friday, February 23rd. They were described as a white man and woman in their thirties wearing medical scrubs. They left before giving any contact information to the shelter staff. [Okay, so how do you know they were New Yorkers as you state in the first paragraph?!] These people should seek medical care immediately and call 311 to notify the Health Department. The Health Department is also alerting City doctors and veterinarians of the possible exposure. It is not known if this raccoon was living in Manhattan, which has had very few cases of rabid animals compared to Staten Island and the Bronx. It may have been transported from another borough. This raccoon is the first animal that has tested positive in Manhattan in 2007; one bat tested positive in 2006. DOHMH warns New Yorkers to avoid contact with stray cats and dogs or other potentially rabid animals such as raccoons, skunks, or opossums and to ensure that their pets’ rabies vaccinations are kept up to date. Rabies is most often transmitted through the bite or scratch of an infected animal or when saliva of the infected animal comes into contact with an open wound or mucous membrane (such as nose or mouth). Simple contact with a wild animal will not result in rabies. Do not touch or feed wild animals, stray dogs or cats, or bats. Keep garbage in tightly sealed containers. Stay away from any animal that is displaying unusual behavior or appears ill, particularly if the animal is behaving aggressively or if a wild animal acts unusually friendly. Call 311 to report animals that are displaying these or other unusual behaviors. Make sure your dog or cat is up-to-date on its rabies vaccinations. Do not leave your pets outdoors unattended. If your pet has been in contact with an animal that might be rabid, contact your veterinarian. First, wash the wound with soap and water IMMEDIATELY. Talk to a doctor right away to see if you need tetanus or rabies shots. If you don’t have a regular doctor, go to a hospital emergency room. Call 311 to report the bite. The New York State Department of Agriculture and Markets announced Monday that they were responding to Maryland's call for help from neighboring states to deal with Emerald Ash Borer, Agrilus planipennis in that state. Although the the presence of EAB in Maryland was confirmed only in August of last year, it's believed to have been introduced by an illegal shipment of infested ash trees from Michigan, a quarantine state for EAB, as far back as 2003. New York is already dealing with Asian Long-Horned Beetle (ALB), Anoplophora glabripennis. New York is sending 11 New York horticulture inspectors and 17 foresters. ... In December 2006, the Maryland Department of Agriculture asked neighboring states for assistance in conducting an inventory of ash trees, identifying infested trees and assisting with the removal of infested trees. A contingent of 11 New York horticulture inspectors and 17 New York foresters will be working with their counterparts in Maryland to quickly isolate and remove infested trees. New York’s participation will provide Maryland with experienced plant pest regulatory officials knowledgeable in tree identification, the target pest and landowner interactions. In return, New York inspectors and foresters will have the opportunity to observe an actual EAB infestation and gain valuable knowledge and experience that will enhance the surveillance and early detection of this pest in New York State. ... Users often experience difficulties naming a plant when the [field] guide refers to a structure (e.g., flowers) that the specimen does not have. If the structure doesn't exist, the user is stuck at that identification step, with limited options for further classifying the plant. Each species name links to the details for that plant. This Amelanchier example is from the Metro version of the keys; each name links to its page on BBG's New York Metropolitan Flora Project (NYMF) Web site. The NY State version takes you to the New York Flora Association Atlas (NYFA) Web site. I'm guessing that the PDA versions of the keys load all these pages onto the PDA instead of linking to the external Web sites, which is why those download files are so large. Petal length: usually less than 10 mm. Finally, the top frame/pane has two buttons which allow you to synch up or filter the contents of the left and right panes. After selecting one or more keys in the left pane, clicking the button filters the list in the right pane to matching genera and species. Similarly, after selecting a genus in the right pane, you can click the button to filter the keys to relevant questions to distinguish species within the genus. (This seems to happen automatically when you select a genus anyway, so I'm not sure why this button is needed.) 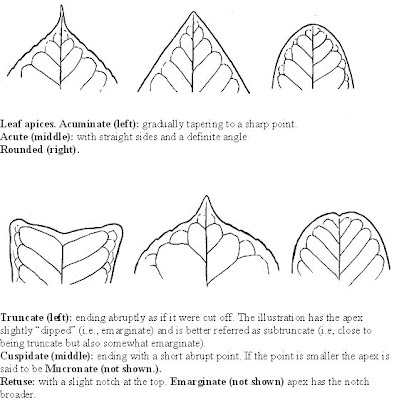 If you know you're looking at an Oak or a Maple, for example, you could use this feature to identify which species. I haven't had a chance to actually use the keys yet to identify anything. But there are some confusing Maples I've got my eyes on. Stinger's Lightweight Interactive Key Software (SLIKS) is the open-source (GPL) software engine for the BBG keys. This page lists some other applications of the software. The list of celebrities from Brooklyn is long and growing. I linked the list to Wikipedia from the Brooklyn Botanical Garden's walk of fame. - "Harvey Keitel or Woody Allen? Brooklyn's Most Famous?" I can say this is about my least favorite feature of the Gardens. It's just odd. The path itself is in a weird place. I never seem to need to go between the two places it joins. It goes behind the Japanese Garden, from one entrance to the other. I'd rather walk through the Japanese Garden. Walking along the path, the stepping stones themselves are just distracting. If only there were some nice views or vistas along the way. If there are, I've missed them because I keep reading the stones! BBG notes that "New names are added to Celebrity Path each June on the borough's annual Welcome Back to Brooklyn Day." So we can look forward to more distractions later this year. Any Brooklynites you would want to add to the list? NASA reports that the five warmest years on record were 2005, 1998, 2002, 2003, and 2006. Put another way, four of the fifth warmest years on record occurred in the last five years. And they expect 2007 to be even warmer than 2006. The top image is a global map showing temperature anomalies during 2006, blue being the coolest and red being the warmest. Areas with cooler-than-average temperatures appear primarily in the northern Pacific Ocean and Southern Ocean, as well as the interior of Antarctica. The very warmest regions appear in the Arctic and the Antarctic Peninsula, which is consistent with climate predictions that global warming will occur more quickly and dramatically in high latitudes. The red colors that dominate the image reveal the overall warmth of 2006 compared to the long-term average. The graph below the image tracks mean global temperatures compared to the 1951 to 1980 mean. This graph shows two lines, the 5-year mean, indicated in red, and the annual mean, indicated in pink. Temperatures peaked around 1940 then fell in the 1950s. By the early 1980s, temperatures surpassed those of the 1940s and, despite ups and downs from year to year, they continued rising beyond the year 2000. There is a Public Competition open for envisioning and designing the future of Gateway National Park, also known as the Gateway National Recreation Area. The deadline for registration is next week, February 28, 2007. Gateway is huge. It covers 10,374 acres of land and 16,233 acres of water, a total of 26,607 acres. For comparison, the entire island of Manhattan is about 12,800 acres. Gateway consists of three "units": One in New Jersey, and two in New York City. The Jamaica Bay Unit straddles Brooklyn and Queens. It comprises the majority of Gateway: it covers 19,752 acres, 12,367 of which are water, the remainder of which are 15 different parks, beaches, wildlife refuges, and other sites of interest. Over 330 species of birds have been recorded in Jamaica Bay Wildlife Refuge, the largest designated area within the Jamaica Bay Unit. Gateway was designated the first urban National Recreation Area on October 27, 1972, exactly one century after Yellowstone became the first national park in the United States and the world. Thirty-five years later, Gateway continues to struggle to meet the aspirations of its founders, to negotiate its relationship with the communities that surround it, and to balance the goals of historic preservation, environmental conservation, and active recreation. Gateway presents a significant regional resource with incredible infrastructural, ecological and cultural value in the New York metropolitan region, hosting endangered birds, fish and shellfish breeding grounds, marinas, playfields, and cultural relics. It is also the site of combined sewer outfalls, treated wastewater effluent, abandoned buildings, degraded habitat, drowned marshes, former landfills and vast asphalt runways. Both the complexity of Gateway and the scope of this design competition call for an immense amount of background information about the park. The materials provided throughout the Site Brief area of the website are taken from a Research Report prepared by a team of investigators from Columbia University's Graduate School of Architecture, Planning and Preservation. The report is comprised of written chapters, extensive mappings, external primary sources and site photographs. It is intended to provide a comprehensive overview of the conflicting issues facing Gateway historically and today. We are pleased to make the majority of this information available to both competitors and the public-at-large. The Research Report can be downloaded in its entirety for the duration of the competition, and selected images and mappings are available for public browsing throughout this section of the website. 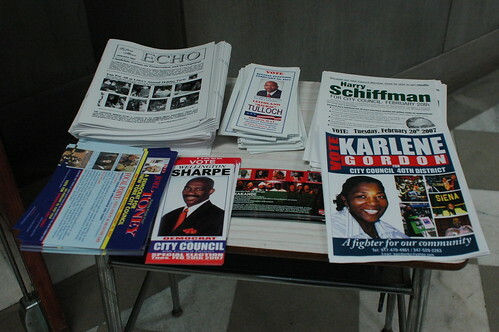 A reminder to all my neighbors in Brooklyn's City Council District 40: Vote today in the special election to select our next City Council-person. Polls are open until 9pm tonight. I already voted this morning on my way to the subway. Our polling place is P.S. 139; the main entrance is 330 Rugby Road, just up the block from Courtelyou Road. The voting sheet looked very odd, with just one row at the top of the sheet, and not enough room to list all 11 candidates! Turnout was extremely light. The winner of this election is likely to do so by a handful of votes. Every vote counts, unlike some elections [g]. I wasn't sure exactly why I started this blog. I've kind of continued on faith that the reasons for it would make themselves known to me. Three encounters in the past month have encouraged me that I'm doing the right thing. At our neighborhood association meeting at the beginning of February, I spoke with one of my neighbors who's also working on our landmarking effort. He mentioned his garden, so I told him about this blog. Turns out he's already a reader. This was the first time I've met a reader in real life. Last Wednesday my partner and I shared the special Valentine's Day dinner at a local restaurant. The other couples sitting around us turned out to all be neighbors. And again, during introductions, I learned that one of the neighbors already knew about this blog. Last Friday I stopped into the storefront office of a business owner I know from the neighborhood. When I walked in, she said "We were just talking about you!" She had just learned about the possible creation of a community garden in our neighborhood, an area with little public open space. She knew of my interest in gradening, even though she didn't know about this blog until that meeting. I think of serendipity as kind of a cosmic wink. I am grateful that this blog brings me in contact with folks from all over the world. It is a gift that it also brings me into contact with my neighbors. Since we bought our home two years ago, I have increasingly found a sense of place here that I've never felt anywhere else. It feels like more than home. It feels like I belong to a community, and that's a sign of some deep healing for me. ... The [NYC] Department of Health and Mental Hygiene (DOHMH) also announced that it has been distributing 1 million condoms per month (more than 9 million condoms in total) to community and social service organizations through a web-based Free Condom Initiative [Requires Flash] that began in June 2005. The DOHMH is currently developing a condom with unique packaging, to be released in coming months. If only they were available in my neighborhood. The NYC Condom Web site includes a link for "Individuals Get Some." Yes, I are an individual, and yes, I too want to "get some," as the kids say. The link provides a complete list of all of the locations where DOHMH is distributing these condoms, which can also be filtered by Borough and/or Zip Code. However, there are no locations for either of the Zip Codes - neither 11218 nor 11226 - which service my neighborhood. Lest you think it's just the luck of the draw, there are several Zip Codes in Brooklyn with multiple locations. 11211, for example, has 13 locations, every one of which is a bar or a "lounge," including Pete's Candy Store, where Jay Bakker's Revolution Church NYC meets. (On my wish list for my birthday, one of their "Religion Kills" t-shirts.) Other Brooklyn locations include parlors, hair salons, clothing stores, pizzerias, restaurants, dry cleaners, and, oh yeah, Department of Health offices. We've got all those and more on the commercial strip of Courtelyou Road, serving both Zip Codes 11218 and 11226. So, come on, business owners, step up and demand to "get some" from DOHMH. Your neighbors and community will thank you. And it couldn't hurt business, neither. Next week, on Tuesday, February 20, there will be a special election to replace Yvette Clarke as Brooklyn's 40th District City Council Member. Clarke was elected to Congress in last year's elections. 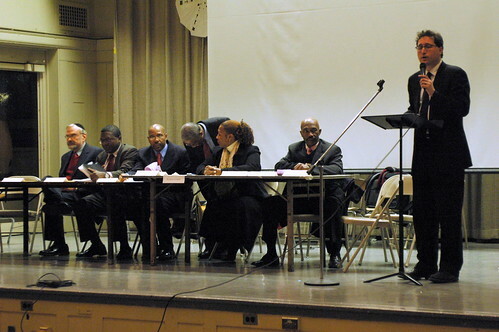 The council member elected on February 20 will serve only until the end of 2007. A general election in November will elect the member to serve the remainder of Clarke's unfinished term. 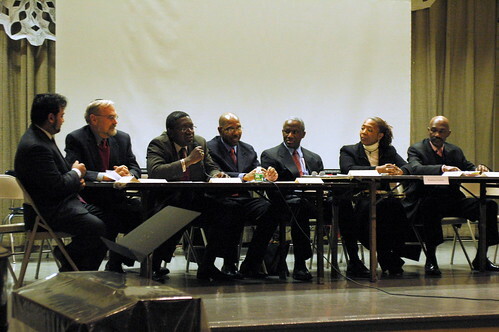 Last week I attended a Candidates' Forum on Preservation and Development. The Historic Districts Council, a sponsor of the Forum, has issued a Preservation Voter Guide. 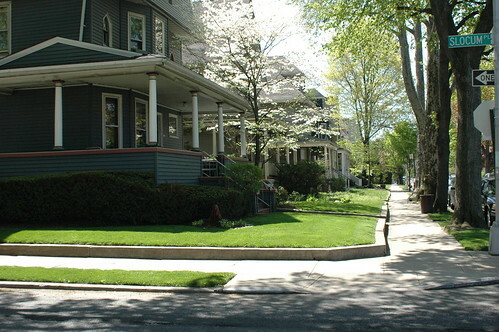 There are several landmarked historic districts within District 40, and hopefully another soon. Still, most of the Victorian Flatbush neighborhoods are at risk of being lost forever due to inappropriate zoning and development. NYC asks us to imagine What kind of city we want to live in by 2030. What happens to this area in the next decade will determine not only what happens by 2030, but this century and beyond. The neighborhoods of Victorian Flatbush are not only worth preserving, it's critical to the future of this area that we do so. It's not just about pretty houses, or property values. It's about open space and shade. It's about the rates of asthma and respiratory disorders. It's about moderating surface temperatures by preserving and managing the urban forest, reducing heating and cooling demands. It's about how many people will die in the heat waves we will experience by the end of the century. It's about the quality of life for the entire area, and whether or not it will be livable in the future. 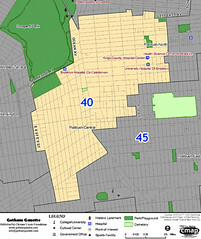 This map shows the locations of schools and parks in City Council District 40. Schools are indicated with blue dots. The green labels identify the location of parks. Open space, including cemeteries, ball fields, and so on, are outlined in green. 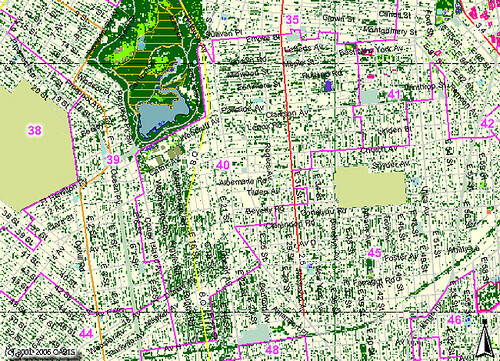 Prospect Park abuts District 40 on the northwest. The Parade Ground south of that is ballfields. Other than that, there is a near complete absence of parks within District 40. This map shows landcover classification in District 40. Dark green areas are trees and forest. Light green areas are grassland, fields and such. Everything else is classified "impervious", ie: buildings, streets, sidewalks, pavement, etc. 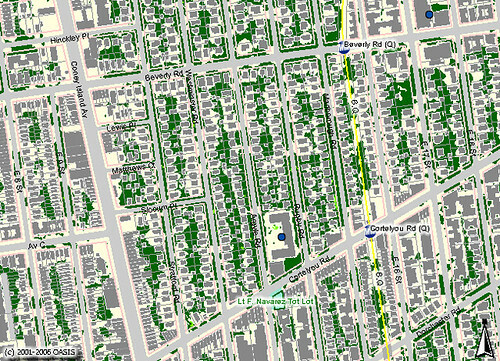 South of Prospect Park, note the interrupted band of dark green that extends to the south boundary of the District. These trees provide the only greenery and shelter in District 40. This area is the lungs of Flatbush. 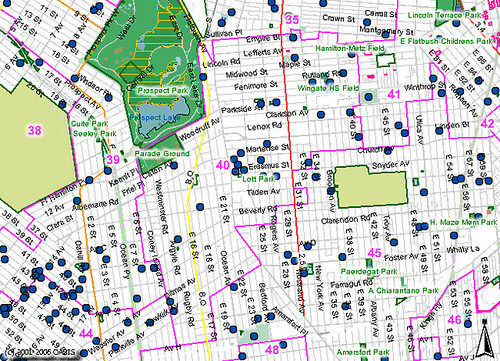 Now we zoom in on my little neck of the woods, the Victorian Flatbush neighborhood of Beverly Square West. This map shows the outlines of buildings and the landcover classification. At this scale, it becomes clear that it is the trees on private property, not street trees, and certainly not parks or "open areas", that provide most of the tree cover. And this is what it looks like from the ground. These two photos show the view from the same street corner on my block, as it looks in Spring and Fall. With no parks for blocks around, and few playgrounds, it's no wonder that parents come to our streets to stroll their babies and walk their children. It's the only green space within walking distance for many people. Even further update: Got them back, thanks to Blogger Tips and Tricks. Further update, 2007.02.14: I lost the expandable post summaries I had carefully customized. I need to figure out how to get that back. Update, 2007.02.14: I think I got everything back, even the bling. If you're still having problems reading or accessing anything here, please leave a comment and let me know. No, I didn't suddenly become more productive. Blogger switched me to the new version this morning, so many old posts are showing up as "new". The template is lost, so it will take me some time to get things back to a readable format. Contrary to popular belief, the earthworms found in the gardens and forests of New England aren't native. Virtually all of the worms north and west of New Jersey were wiped out during the ice age that ended about 10,000 years ago. European earthworms -- or their cocoons -- first hitched rides to the New World on the root balls of colonists' plants or in dirt that was used as ballast in ships to steady them on the long journey across the Atlantic Ocean. In the 1800s, much of the region's vast forests were cut down for farmland, and worms -- clinging to plants or even plows' wheels -- were introduced to more areas of New England. A patchwork of wormed and worm-free woods was created when forests later reclaimed the farmlands. Now scientists suspect that humans are again bringing worms into New England's remaining worm-free woods. Fishermen abandon nightcrawlers or other worm bait at fishing holes. Second homeowners are worming their property with landscape dirt and, possibly, compost piles. Hikers and campers unwittingly bring along worm cocoons, wedged in the tire treads of their cars. Earthworms are an example of an ecosystem engineer, an organism which modifies its environment with the effect of creating, maintaining, or destroying habitat for itself and other organisms. Gardeners and farmers collaborate, intentionally or accidentally, with many different engineering species. Earthworms are only one example. Clover and other "cover" crops, livestock, even trees are other examples. In the gardens around the house, I'm faced with neglected, compacted, weedy and unproductive ground. To rehabilitate the gardens, I need to enlist some ecosystem engineers. I started some small patches of clover, inoculated with nitrogen-fixing bacteria. I want to expand that this year to other areas, including the hell strip between the sidewalk and the street. Last year I also ordered earthworm cocoons and introduced them into the backyard. That was before I began reading about the damage earthworms can cause to native forests whose assemblage of species evolved without their "help." Knowing what I know now, I would still do this in my yard. This territory has not been "natural" for hundreds of years. But there are natural areas even in New York City which deserve protection. If I lived closer to them, I would be more cautious about what I introduced into my gardens. We are gardeners of the world. We are ecosystem engineers on a global scale. Like it or not, we are past the point where the natural world can survive, let alone recover from, our predations, intrusions, and blunderings without our help. If we engage in this work consciously, there is some hope that we can reverse some of the damage we've caused. 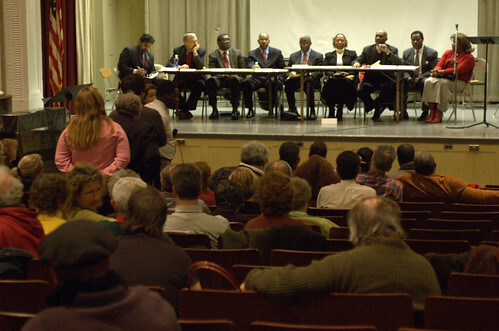 Tonight I attended the New York City Council 40th District Candidate Forum on Preservation and Development. Tonight's Forum was sponsored by the Coalition of Concerned Preservation Voters in the 40th District, comprised of 11 community organizations and neighborhood associations, including that of Beverly Square West, where I live. Jesse Hamilton was not present. About 100 people attended the event. I was surprised by the turnout, especially since the wind-chill was in the single digits. I'll post some more photos over the weekend. Simeon Bankoff, Executive Director of the Historic Districts Council, kicks off the Forum. 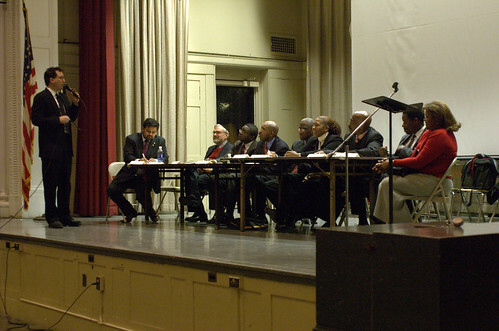 The candidates make their opening statements. 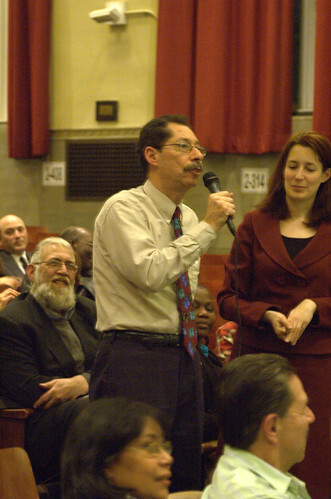 Ron Schweiger, Brooklyn Borough Historian, poses the first question from the audience to the candidates. Tomorrow, Thursday, February 8, the Historic Districts Council and the Coalition of Concerned Preservation Voters in the 40th District are sponsoring a public forum with candidates for the City Council's 40th District special election. 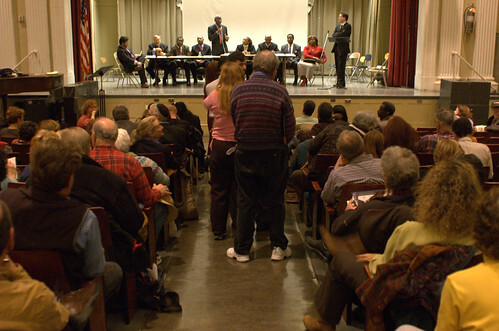 As the District includes several historic districts in Flatbush, candidates will discuss important preservation and development concerns including questions of landmark designation, community plans, rezoning and building code enforcement within the district. The Coalition is made up of more than ten neighborhood organizations interested in preserving their communities. My neighborhood association in Beverly Square West is part of the Coalition. I will be there tomorrow night. The following candidates have confirmed their participation: Mathieu Eugene, Karlene Gordon, Jesse Hamilton, Jennifer James, Zenobia McNally, Harry Schiffman, Wellington Sharpe, Joel Toney and Leithland Tulloch. On Friday in Paris, the International Panel on Climate Change (IPCC) released the first volume, "The Physical Basis of Climate Change," of their Fourth Assessment Report, "Climate Change 2007." The Summary for Policymakers (aka SPM, available in PDF only) presents the synopsis of the findings. Other sections of the full report will be released later this year. I've been reading the reactions and responses - angry, depressed, pessimistic, or nihilistic - to this report from my favorite garden and nature bloggers. We are experiencing, and witnessing, grieving on a global scale. We are grieving for the world. And the world is grieving. I've been processing my own feelings about all of this, and trying to formulate my own response. For now, I don't want to respond directly to the IPCC report, nor others' reactions to it. Here's all I want to share right now. If you think a street tree is in danger, take a photo of it. This will serve as a "before" photo, a valuable piece of evidence. If you see workers cutting down a tree illegally, don't call 311. Call the borough's forestry office ... These are Parks Police Officers, they have the power of arrest and will be dispatched to the scene. Write down the name and address of the contractor removing the tree, if available, (it may be on the construction fence or truck) and take a photo of the crime in progress. The officers will use these to track down the offenders if they have left the scene. You may be asked to sign an affidavit of what you saw if the perpetrators were gone upon the officers' arrival. Your name does not appear on it and you just have to sign your initials. The officers will visit you at home, you won't even have to go to their headquarters. This will be used in court. You may also be asked to testify in person, but this very rarely happens because the developer doesn't bother to fight the fine. - Watch That Street Tree!, via Gowanus Lounge. 311 is the general information line for all city services. When you don't know who to call, that's the number to call. The Department of Parks and Recreation has jurisdiction over street trees in NYC. Only people employed by or under contract from Parks can perform any work on a tree. 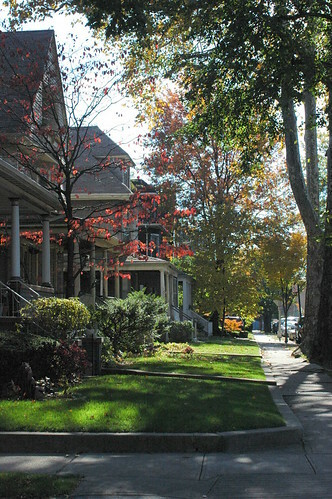 Residents should read Caring for Street Trees and Greenstreets to learn what they can do to keep their street trees healthy and cared for. Flowering fruit trees, houseplants, lucky bamboo and cut flowers will be on sale at the Flower Market in the Palm House. Tours of plants in BBG's collections which are native to China, Korea, Vietnam or East Asia are offered in the Steinhardt Conservatory. Tours are available in both English and Mandarin. Performances in the Palm House by Nori Company, Huaxia Edison Dance Troupe, and Qi Shu Fang Peking Opera. Workshops and demos are offered throughout the facilities. Visit BBG's web site for full details. This lecture by Dr. David Bonter of the Cornell Lab of Ornithology is hosted by Martin Viette Nurseries in East Norwich, Long Island, New York. Drawing up on the knowledge of 14,000 people participating in Project Feeder Watch, this presentation will help you understand the biology and survival strategies of our favorite birds of winter. Learn how to attract colorful birds to your yard and discover the food and feeder preferences of New York's Top 20 most common feeder birds. Finally, learn how you can contribute to science by watching the birds in your own backyard. Project FeederWatch is a winter-long survey of birds that visit feeders at backyards, nature centers, community areas, and other locales in North America. FeederWatchers periodically count the highest numbers of each species they see at their feeders from November through early April. FeederWatch helps scientists track broadscale movements of winter bird populations and long-term trends in bird distribution and abundance. Project FeederWatch is operated by the Cornell Lab of Ornithology in partnership with the National Audubon Society, Bird Studies Canada, and Canadian Nature Federation. Happy Imbolog to all my fellow gardeners! Groundhog Day, celebrated on February 2, has its roots in an ancient Celtic celebration called Imbolog [Wikipedia: Imbolc]. The date is one of the four cross-quarter days of the year, the midpoints between the spring and fall equinoxes and the summer and winter solstice. 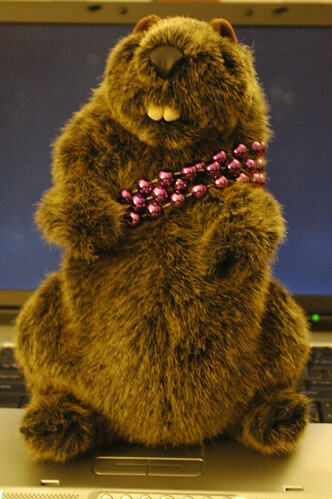 The groundhog, Marmota monax, also known as a woodchuck, or whistlepig, is the largest species of marmot in the world. Imbolog, marking the midpoint between the winter solstice and the spring equinox, was the most important of the cross-quarter days. In a society dependent on agriculture and therefore on the weather, this was a time to celebrate having made it halfway through winter. The superstition arose that if the weather was fair on Imbolog, the second half of the winterwould be cold and stormy, but if the weather was cold and overcast or stormy, the second half of the winter would be mild. In early Christian times, February 2 was celebrated as Candlemas, but the earlier Imbolog superstitions persisted. In medieval Scotland, for example, they said, "If Candlemas be bright and clear, there'll be two winters in the year" and in England, they said, "If Candlemas be sunny and warm, ye may mend your mittens and look for a storm." The Romans learned these traditional beliefs from the Scottish Celts, and brought them to the area that was to become Germany, where they became a part of the folk culture. German immigrants brought these beliefs with them to Pennsylvania, where the tradition of predicting the weather became centered around the woodchuck or groundhog. The town of Punxsutawney, Pennsylvania, has an annual celebration centering around the activity of the groundhog "Punxsutawney Phil."